Unlucky enough to get sick on the last day of the long holiday weekend, I decided that since I was cruising the couch anyway, I’d make the most of it by engaging in a cinematic experiment. After reading a good chunk of the source material, I watched both big screen adaptations of Scott Spencer’s contemporary classic Endless Love, starting with the most recent title and wrapping up my teen romance double feature with the 1981 original from Romeo and Juliet director Franco Zeffirelli. A Nicholas Sparksian makeover for a Notebook crazy tween audience who’ve been showered with one lukewarm romantic shampoo ad of shiny happy, golden people after another, Country Strong director Shana Feste helms a blandly sunny wrong-side-of-the-tracks romance that bears little resemblance to wither the novel or Zeffirelli’s oft-maligned version. In fact, when watched back-to-back, miraculously it’s Zeffirelli’s film that fares much better in that it at least adheres to a few of Spencer's major plot points (albeit while spinning them in a much more romantic and altogether positive light) than the modern remake which ditches most of the building blocks of the book altogether. Lacking the unreliable narrator one-two punch of the original Spencer work including the ominous opener which foreshadows the idea that perhaps the father of fifteen year old Jade wasn’t wrong in enforcing a thirty-day “break” in her relationship with her seventeen year old boyfriend, the lovers in the '81 movie seem doomed mostly due to unrelenting hormones, bad luck and mixed messages in her free-spirited hippie home. However the 2014 remake produced by The O.C., Chuck and Gossip Girl's Josh Schwartz and Stephanie Savage has not only erased the dark undercurrent that made the book so absorbing but it lacks any sort of unique edge that might’ve kept things fresh enough for the 105 minute running time of what is otherwise a by-the-numbers romantic movie paradigm. Instead of opting for the unusual, we’re given more of the same while being fed a heaping spoonful of sudsy cheese about a beautiful but shy Georgia beauty who’s been nicknamed “the ice queen” by a majority of her more unforgiving of her classmates after the death of her older brother found Jade (Gabriella Wilde) burying her head in books instead of social media selfies. 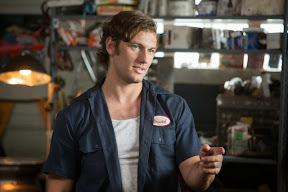 Hopelessly devoted from afar, the valet at her country club and fellow recent high school graduate David (Alex Pettyfer) flirts Jade out of her icy shell as she melts unrealistically far too quickly and eagerly – hopping in a “borrowed” country club car for an illicit fast food run in a scene that’s totally out-of-character. And taking a cue from David’s borrowed ride, the film borrows a few moments straight out of the Say Anything… playbook including a scene where Jade loosens up at a party with David and finally “meets” her classmates before she must choose between her burgeoning relationship with David and taking an internship (versus a fellowship in Crowe’s Anything). Nowhere near as compelling or original as the characters penned by Cameron Crowe, the young lovers in Feste’s film have been likewise stripped of any beguiling or discerning traits from Spencer’s novel as the well-mannered yet at times quick-to-temper David is missing any trace of the Jewish communist intellectual background of his Russian author reading character from the Zeffirelli version. Moving the Chicago-set tale to idyllic Georgia, Endless Love (which doesn’t even contain the lovely theme song or a new version of it to fit the work) manufactures drama from start to finish, turning David into a working class blue collar budding mechanic hero straight out of a music video for a boy-band cover of a Bruce Springsteen song. And this is particularly disappointing when you consider that – if anything – why remake a film if you’re not going to present us with some new worthwhile angle or stay closer to the source material, like for example Kimberly Peirce attempted to do in the intriguing although admittedly unnecessary female-centric spin on Carrie (also co-starring Gabriella Wilde)? 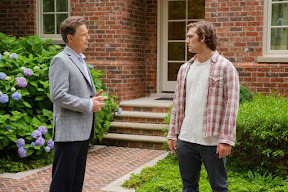 While the two lovers have terrific chemistry and both actors are more deserving of better scripts, it’s Bruce Greenwood in particular that easily classes up the picture and steals every scene he’s in as Jade’s overprotective father. Unfortunately, in the end this Love has much more in common with a Nicholas Sparksian spin on Say Anything… than anything resembling the Spencer novel. And even though there’s no law stating that the filmmaker must remain faithful to the book as their only job should be to make an engrossing, solidly entertaining picture, there’s nothing in the final cut that explains why Feste felt so strongly about the project to bother helming it in the first place. While it's beautifully lensed and makes impressive use of a vibrant color palette to punctuate the passions of its two leads by frequently featuring Jade in eye-popping, powerful red so that she sticks out in a sea of dark clothed party-goers or passersby at the airport, visuals alone can't sustain our interest. A Hollywoodized feature, Endless Love seems to signify that Feste has taken far too many steps in the wrong direction while selecting the follow-up to her flawed yet admirably daring and endlessly fascinating previous picture Country Strong, which was buoyed by an ensemble cast of remarkable characters (and the actors inhabiting the roles). 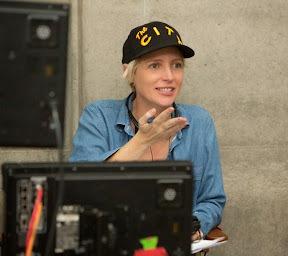 I only hope that this talented, up-and-coming writer/director will get back on track in her next project by staying away from endlessly unnecessary remakes or adaptations and instead listening to and trusting the endless strength of her own uniquely original voice.